Now I don't know if the producers of the show already have someone in mind, but Steve Jones (the host that you probably don't remember from season 1 of the X Factor) was recently fired from his spot and they need someone new to fill his shoes. 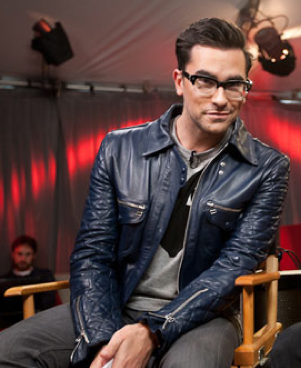 Now I know it is a long shot, BUT I think Dan Levy would be perfect. Seriously. They could totally sell him cause of his dad. I know it is shameless, but come on...it's the entertainment biz. You gotta have an angle. AND he already works with the show as the online web interviewer guy....so just slide that gem of a human over. SO EASY. Dan, you need to enquire about this asap. And world...you need to get behind him! UPDATE: Reports are out that Nicole Scherzinger is also leaving the show to pursue her music. UPDATE 2: Paula Abdul has reportedly also got the boot from the show! Shoooooooot. Ok, if they get legit people to replace those 2 hos I am totally going to watch.